Many individuals expect age-related deterioration of essential brain functions: thinking, reasoning, memory, imagining, learning, attention and concentration. This need not be true. With proper nutrition, exercise, cognitive stimulation and other healthy lifestyle choices, sharp brain function can be a lifetime benefit. In addition to taking Futurebiotics ThinkFast, a healthy brain-boosting diet should include a variety of fruits, vegetables and whole grains. Also include lean meats, fish and low-fat dairy. Limit red meat. Use sugar and salt in moderation; limit processed foods and fats. Take a complete multi-vitamin every day and include an Omega-3 supplement. Increase your intake of folic acid as studies have shown it may slow mental aging. Experts agree that 30 minutes of daily exercise contributes to healthy brain function. Mix things up. Recent studies suggest that variety in exercise activities may be protective to mental health. Brain cells respond to stimulation - so use it or lose it. If you don't stimulate and use your brain, it will atrophy. Learn new skills; alleviate boredom. Reading and memorization are particularly helpful. Meet new people and learn new things. Stay active both physically and emotionally. Volunteer work is a fun way to keep active. Stimulating all your senses will help stimulate your brain. Include activities that stimulate hearing, vision, touch, smell and taste, and motor skills. To increase focus and memory, minimize noise and distractions. Smoking contributes to blood vessel damage in the brain. Limit your exposure to second-hand smoke, too. Alcohol has a damaging effect on the brain and memory. Measure Your Progress - Monitor your cognitive skills and responses. Stimulating activities and proper nutrition will noticeably help attention, memory and overall brain performance. ThinkFast - taking inspiration from Nature. This 100% vegetarian product has an aromatic botanical essence added, along with natural whole plant co-factors including Gotu Kola leaf, Soy Lecithin & Rosemary. Clinical studies have shown that the botanical extracts in CogninSA may increase sustained attention, thereby improving ability to learn complex tasks and maintain consistency. 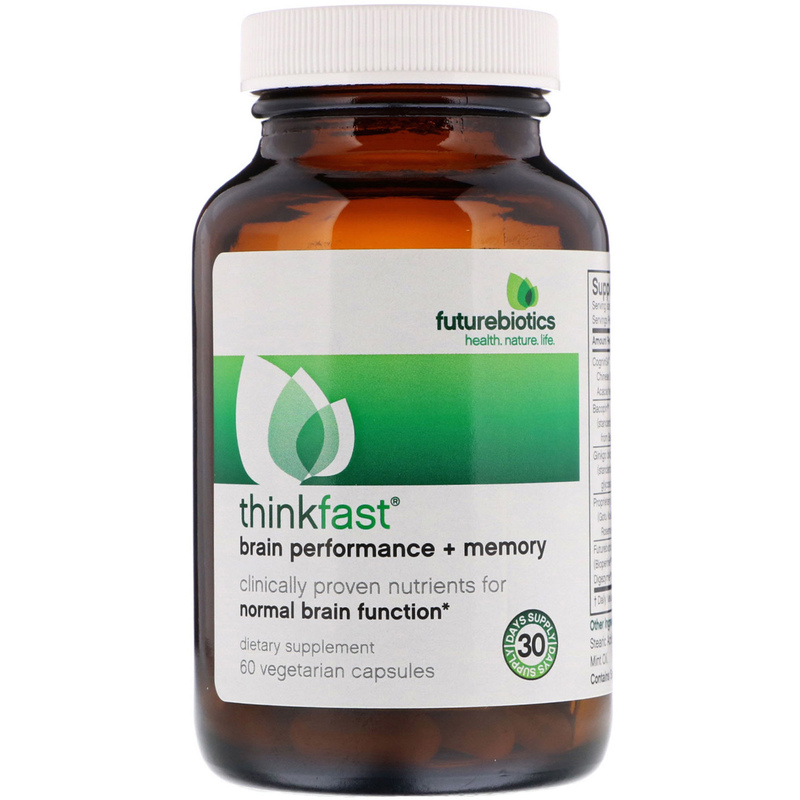 Coupled with Bacopin, Ginkgo extract, and a proprietary compound of brain-boosting nutrients, including L-Theanine, ThinkFast is an advanced formula that supports brain performance, attention and memory. CogninSA supplies a clinically-proven, patented-pending blend of Chinese Skullcap root extract (Scutellaria baicalensis) and Acacia heartwood and bark extract (Acacia catechu) that has been shown to improve working memory speed, measured as reaction time - often equated with mental flexibility as well as superior decision making. Ginkgo biloba extract has been used for over 5000 years. Modern research has demonstrated that Ginkgo extract has the ability to enhance blood flow to the brain which aids memory. Bacopin is a proprietary extract derived from the leaf of Bacopa monnieri and has been used for centuries to help improve mental performance. Scientific evidence supports its long, traditional use. ThinkFast contains a brain-boosting compound of complementary healthy nutrients and herbs, including Suntheanine L-Theanine which may have neuroprotective. Gotu Kola, Rosemary and Soy Lecithin are included to provide natural whole-plant co-factors nature created. 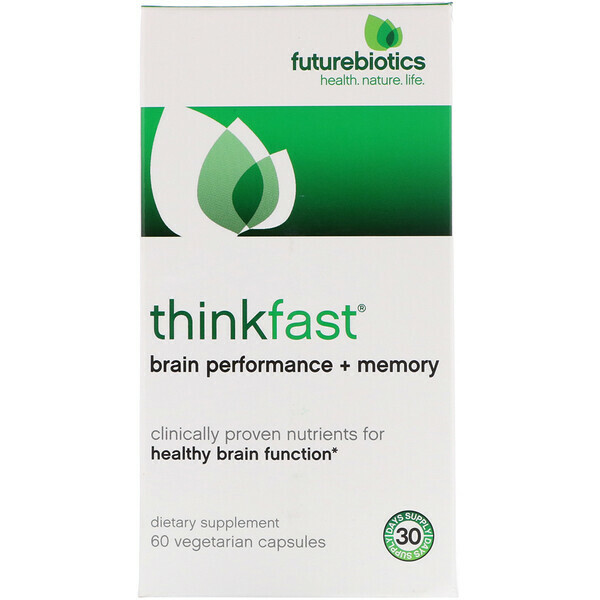 ThinkFast is potency-enhanced with Futurebiotics BioAccelerators. 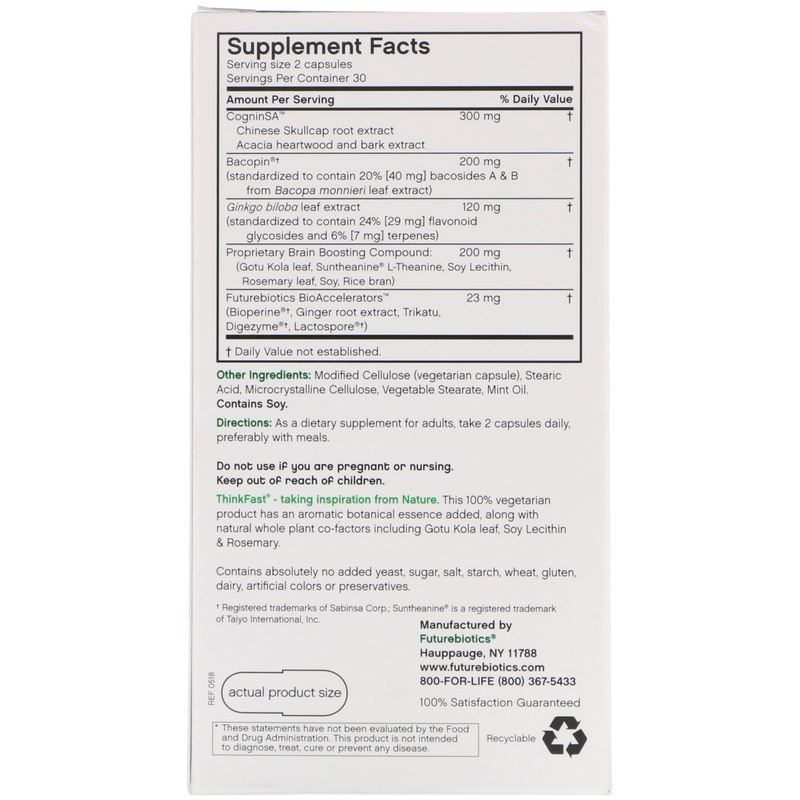 Clinically-proven Bioperine (piper nigrum extract) improves nutrient bioavailability, while our proprietary natural compound of Ginger extract, Trikatu, super-potent Digezyme and Lactospore boosts digestion and absorption. Modified cellulose (vegetarian capsule), stearic acid, microcrystalline cellulose, vegetable stearate, mint oil. Contains soy.